Ever think about homeschooling your child? Want a safe environment for your kids to learn and grow? Fed up with the school system as it is now? So many people are, and that’s why they are turning to homeschooling. It’s not something that’s happening in select communities, but everywhere, across Arizona and the nation. Approximately 1,770,000 school-aged children are homeschooled nationwide. In Arizona, homeschool programs are popular and growing. In 2012, the National Center for Education Statistics estimated there were 27,404 Arizona students homeschooled, and that number increased by 28 percent in 2017 to an estimated 35,179. Homeschooling your child offers many academic and social benefits. In Arizona, you can access public and charter internet homeschool programs online. Parents can customize the curriculum according to the child’s needs and wants. Homeschooled children accomplish more work at home than school-based children because they use their time more efficiently. Homeschooled children have the advantage of different pedagogical approaches to learning – rather than the standard approach based in Arizona schools. The family unit is strengthened through interactions with each other. Children can learn and grow and a safe environment free from bullies, drugs, racism, and other intimidations that occur on school grounds. Homeschooled children are also more engaged with other homeschool children through programs offered by the state for this specific purpose. The result of these benefits is clear: home-educated children score better than public-schooled children on standardized academic achievement tests. In fact, according to the National Home Education Research Institute, they score 15 to 30 percentile points above the average public-school student, and these outcomes occur whether the home-parent is well-educated or not. To any parent, these benefits sound pretty good. The only problem: where do they start? Why is homeschooling growing so quickly in Arizona? The internet, in part, is why homeschooling is excelling. Internet homeschool programs have made homeschooling more accessible. With the internet, homeschool programs spread like wildfire. Internet homeschool programs are literally everywhere, and parents can access these programs through increasingly available digital learning sources.. Programs through the Arizona Families for Home Education offer accredited home-based programs. Teachers are provided as well, so parents do not have to do all the teaching themselves. Homeschooling, in this way, has become more structured, thus the reason why so many homeschooled children do better than school-based children: they have the structured quality education presented to them in a safe, comfortable environment conducive to better learning. But access to the Internet is the real key to its growth in numbers. Many homeschooled children are in remote areas where access to the internet was traditionally more difficult. 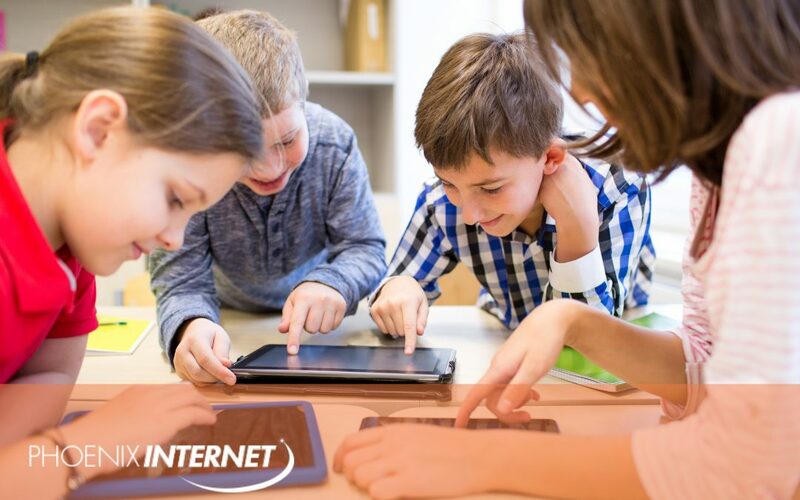 Families in remote, rural areas to dense, urban areas now have access to internet homeschool programs through internet providers like Phoenix Internet. Phoenix Internet provides quality service with unlimited data to families in both rural and urban regions of the greater Phoenix, Arizona area. Today, it doesn’t matter where or when you teach your child, as long as you have access to the internet. What are internet requirements for homeschooling in Arizona? There are no internet requirements, per se, in order to access an online homeschool program: you just need access to the internet. That said, to fully benefit from these internet homeschool programs, you need internet access that is dependable, high-speed access. It would also benefit you to have a high amount of data or unlimited data. Having dependable internet access is key to success; having the internet go down in the middle of class is not only disruptive, but it cuts into efficiency. Having unreliable internet access is counterintuitive to homeschooling since it affects the flow of the learning process. For this reason, high-speed access is preferable. You don’t want to have to wait for a program to download or have your online teacher’s presentation slowed by slower internet service. You might as well just close the laptop and read the books. But then again, that defeats the purpose and benefits of these well-orchestrated online programs that are in part reason for homeschooling success. Then there’s the data issue. Net neutrality’s repeal calls into question internet service providers’ provision of data and access to different websites on the internet and an increase in costs to have those services. For homeschooling to be beneficial, you need data to download educational programs. Those programs, however, can take up a lot of data. If your internet provider has caps, you can expect your monthly bill to increase dramatically. Fortunately, some internet service providers have no caps on data. They are hard to come by, but Phoenix Internet provides this service to its clients in Arizona. With the relief that comes from no data caps, you can rest assured your child will have the best homeschool experience possible. You need an internet service provider that offers excellent quality, high speed, no data caps as part of its package if you want to realize the full benefits of homeschooling. Phoenix Internet can provide service anywhere in the Phoenix area. If you have chosen to homeschool in Arizona then your child’s education is in good hands. At Phoenix Internet, we take pride in doing things differently by providing excellent services. We offer fast and reliable internet access via exceptional customer service. Reach out to our team today so you can provide your child with the best internet homeschooling possible.